LANDOVER, Md. –The Packers did not come into the playoffs as a hot team, but they might be hot now. Green Bay’s 35-18 victory over Washington on Sunday at FedEx Field in an NFC wild-card game sends the Packers to Arizona for the divisional round. The game with the Cardinals is slated for Saturday night at 7:15 p.m. CT. The Packers’ running game came to life in the second half and the defense posted sacks at important moments as Green Bay won a road playoff game for the first time since 2010. Trailing 11-0 early in the second quarter, the Packers dominated from there in outscoring the Redskins 35-7 the rest of the way. RBs James Starks and Eddie Lacy combined for 116 rushing yards on 24 carries, with a TD each. 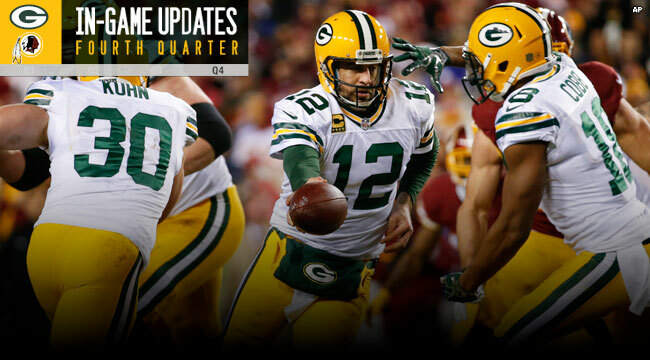 QB Aaron Rodgers, who started the game 1-for-8 for 11 yards, finished 21-of-36 for 210 yards with two TDs. WR James Jones led the receivers with seven catches for 84 yards, while WRs Randall Cobb and Davante Adams had a TD catch apiece. Cobb also added 24 yards rushing, though Adams left the game with a knee injury. Redskins QB Kirk Cousins was 29-of-46 for 329 yards and a TD. TE Jordan Reed had nine catches for 120 yards and a score to lead the Redskins. The Packers began the fourth quarter by marching the final 50 yards of a 10-play, 76-yard TD drive, with all of the fourth-quarter snaps on the ground. Starks broke off runs of 11, 7 and 4 yards to the Washington 28. An offside penalty preceded a 21-yard run by Starks down to the 2-yard line, and Lacy finished it from there. Rodgers fired a 2-point pass to WR Jared Abbrederis, boosting the Packers’ lead to 32-18 with 12:23 left. Washington countered with a drive that reached Green Bay territory, but the defense held up there. A 12-yard run by RB Alfred Morris preceded a 22-yard catch-and-run by TE Jordan Reed, putting the ball at the Green Bay 37. LB Clay Matthews looped around on a stunt and sacked QB Kirk Cousins on the next snap, though, with a little help from fellow LB Nick Perry, putting the Redskins in long yardage. CB Damarious Randall and S Morgan Burnett collided on a pass that easily could have been intercepted by one of them, but the miscue didn’t hurt, as Cousins threw incomplete on third-and-19, and the Redskins punted. Backed up to their own 9-yard line with 8:56 left, the Packers got out of the hole thanks to a defensive pass interference call on CB Quinton Dunbar on a deep sideline pass intended for Jones. Abbrederis came up one yard short of the first down on a third-and-6 completion, though, and the Packers had to punt it back. P Tim Masthay hit a 55-yard boomer that WR Jamison Crowder fair-caught at his own 9-yard line with 5:55 to go. Washington managed one first down, but that was all. Rookie CB LaDarius Gunter broke up a pass for WR Pierre Garcon on third down, and Perry sacked Cousins on fourth down to give the ball back to the offense on the Washington 17-yard line with 4:58 left. Starks ran the ball down near the 10 as the Redskins burned all three of their timeouts, and K Mason Crosby made it a three-score game with a 29-yard field goal, giving the Packers a 35-18 lead with 4:39 to go. The Redskins drove all the way inside Green Bay’s 10-yard line, but on fourth down, LB Mike Neal got yet another sack for the defense, turning the ball over on downs with 2:46 on the clock. It was the Packers’ fifth sack of the game. Washington got the ball back with 1:51 left when Lacy fumbled at the end of a 9-yard run and a replay review reversed the call on the field. The Redskins got back into the red zone, but Perry and Mike Daniels combined on Green Bay’s sixth sack of the game on third down, and the Packers got the fourth-down stop to finally close it out.